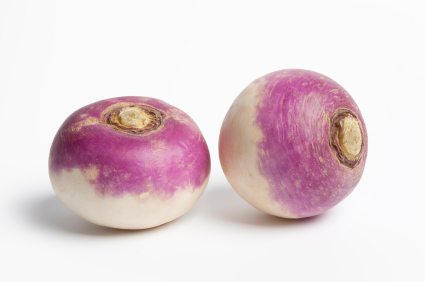 Turnips are a hardy vegetable that grow best in cool weather. Plant seeds directly in the garden 6 weeks before the frost date. You can plant 16 per square and then thin them to 9 per square as you use the tops for greens. If you live in a climate with hot summers, choose varieties that mature quickly. Plant seeds 10 weeks before the frost. If you live in a mild climate with a late or no fall frost date (after Nov 1), you might be able to grow turnips all during the winter. Turnips grows best in a rich soil; amend with lots of compost and fertilizer (chemical or organic) at planting and once during the season. Fertilizer: 16-16-8 at planting, 21-0-0 six weeks after plants emerge. Harvest when tops are 6-8″ tall and roots are 2-3″ in diameter.